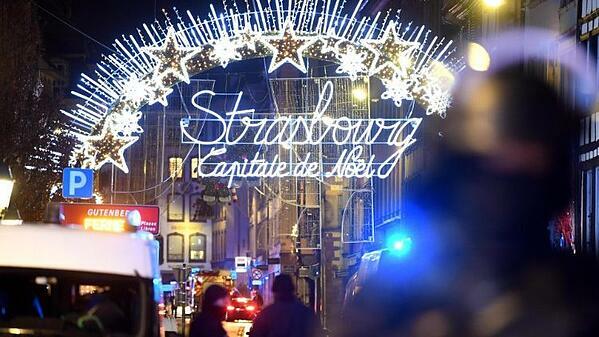 Just after 19:00 GMT, reports emerged of gunshots close to Strasbourg’s famous Christmas market in Place Kleber. Moments after the first shots, a significant police response descended on the market, just as it was closing. It soon became apparent there were a number of gunshot casualties, later confirmed as three dead, at least 12 injured. Local witnesses report the gunman discharged his weapon numerous times in close succession. The city was placed under immediate lockdown, including the European Parliament complex. Security forces already deployed at the scene as part of Operation Sentinel exchanged gunfire with the suspect during the initial incident, wounding him in the leg. A soldier also suffered a ricochet wound during the exchange of fire. The suspect is said to have escaped in a taxi and was later dropped off in a residential area in Neudorf, close to the German border, prompting a security alert during which residents were urged to remain indoors. A motive has not yet been established although authorities have named the individual as 29-year-old Cherif Chekatt, a French national born in Strasbourg and already known to the security services. Police have confirmed the wanted suspect was on their “fiche S” list, and it is understood officers had attempted to serve an arrest warrant at his residence on the morning of 11 December, although this is not believed to have been terror related. Hand grenades were discovered during a search of the property although he was not there. Chekatt has served prison sentences in both France and Germany, primarily for robbery; however, reports are emerging from French media sources claiming the suspect had become radicalised during his last prison sentence. A major security forces operation remains ongoing to apprehend the gunman, who remains at large. The French government has increased the country’s terror threat level to “Urgence Attentat” or “emergency attack" in English, the highest on their three-tier scale. At around 20:04 CET, (19:04 GMT) on Tuesday 11 December 2018, reports began emerging of gunshots being fired close to Strasbourg’s famous Christmas market, held annually each year in the city’s central Place Kléber square. The market attracts thousands of visitors and the incident took place just as it was closing for the evening, hence the area was especially busy. A lone gunman is reported to have opened fire in three different locations within the city centre in the vicinity of Place Kléber, killing three people and wounding several others. The weapon was described by local witnesses as a high-powered assault rifle although police have yet to confirm the details. The gunman is said to have exchanged fire with police and troops twice between 20:20 and 21:00 CET, during which he was shot in the leg, and a French soldier received a ricochet wound from a bullet fired by the assailant. Immediately after the first shots, soldiers and police officers already deployed at the event as part of Operation Sentinel, responded to the situation, effectively locking down the area and either ushering the public away from the scene or advising shelter in place. However, the suspect managed to hail a taxi and subsequently evaded capture, leaving Place Kléber and getting dropped off in the nearby suburb of Neudorf, close to the German border. Later questioning by police confirmed the gunman had been wounded. The city centre lockdown was subsequently lifted around 01:30 CET, Wednesday 12 December although strict security remains in place at this time. In addition, the French government has raised the security alert level for terrorism to its highest, “Urgence Attentat” or “emergency attack" in English, reinforcing security at all locations designated ‘high profile’ such as airports, ports, train stations, public transit, shopping centres and tourism sites. Security at border crossing points has also been strengthened amid concerns the suspect will attempt to cross into Germany to evade capture. As part of the increased security measures, all protest action has been banned within Strasbourg, and this is likely in respect of the fact other areas of the country have experienced widespread protests aimed at highlighting perceived economic frustration and political distrust. The Christmas market will also remain closed during Wednesday 12 December. Although the identity of the suspect has been released, his motives are yet to be confirmed. Nevertheless, early indications point toward the attack being carried out under the guise of terrorism, particularly following confirmation from the French prosecutor that the gunman shouted 'Allahu Akbar' as he opened fire on Christmas market goers. The suspect is confirmed as 29-year-old Cherif Chekat, who is known to the security services and has a long criminal history across France, Germany and Switzerland. According to French authorities, Chekat was on their “fiché S", translated as “S file”; a system used to flag and monitor individuals who are considered a serious threat to national security. Although Chekat was on the list and under surveillance, it is understood a police operation on the morning of 11 December, which took place at the suspects home address, was linked to an investigation surrounding a robbery investigation, and not terror related. According to French media, a subsequent search of the property revealed hand grenades and weapons; however, the suspect was not at home. A number of other arrests have been made on Wednesday morning relating to individuals linked to Chekat, who has been confirmed as a French national born in Strasbourg. At this time, no claim of responsibility has been received from any terrorist organisation, and no link has been established between Chekat and any such groups. However, there are indications the gunman had been radicalised whilst serving a prison sentence in France. As has been the case in previous terrorist attacks on French soil, it is possible the attackers had no direct links with any militant group, but are instead inspired by the ideology of the likes of IS, often as a result of radicalisation. This is the latest in a string of attacks across France since the 2015 Charlie Hebdo shootings, resulting in 245 people losing their lives. This incident also once again highlights the vulnerability of high profile public locations, particularly in areas such as Place Kléber, which has a high concentration of restaurants and bars in a confined proximity. In addition, whilst the attack delivery method varies, with vehicles being used as a primary means to cause mass casualties in previous circumstances, ‘soft-targets’ such as major public events continue to be favoured in spite of heightened security, which makes these attacks very easy to orchestrate but extremely difficult to prevent. There is also an increased risk posed by would-be ‘copy-cat’ attackers in the future, despite the best efforts of the security services. Christmas markets represent a target-rich environment for terrorists for a multitude of reasons. Their significant numbers (2,234 in Germany alone) make it difficult for security services to dedicate sufficient resources to adequately protect them all. The largest and most prestigious venues in London, Cologne, Brussels and Strasbourg (to name but a few) attract millions of visitors over the course of the season, ensuring substantial target density. They may also hold symbolic value for IS militants due to their connection with the Christian faith. In 2000, German and French police foiled an attempt by al-Qaeda-linked terrorists to detonate an improvised explosive device (IED) at Strasbourg’s market. Additionally, in 2010, German police warned its citizens that it had received firm intelligence detailing a plot to attack shoppers at the country’s Christmas markets. In light of this attack, security provisions are likely to remain high, particularly in places vulnerable to similar mass casualty attacks, including public areas, railway stations, and public transport hubs. Whilst a latent threat from terrorist attack exists, there is no need to restrict travel to France at this time. Travellers are however advised to take additional precautions and anticipate delays due to enhanced security measures. There will be a noticeable police presence in all major French cities, with a focus on airports, train stations, entertainment venues, public spaces and busy tourist sites. A large number of those officers deployed will be heavily armed and specifically trained to counter the terror threat. Military deployments will continue as part of Operation Sentinel, with as many as 10,000 soldiers and almost 5,000 gendarmes deployed across ‘sensitive’ locations countrywide. Again, although no specific travel restrictions have been announced, travellers are advised to anticipate potential disruption owing to the increased security presence, and to remain vigilant at all times. Whilst the situation remains fluid and the security scenario unpredictable at this time, particularly in the Strasbourg area, the public are being advised to go about their business as usual but to remain extra vigilant. The area around the incident remains cordoned off and should be avoided until further notice. Local public transport services have now resumed and road access to the city centre restored, although security checkpoints should be anticipated. Although there is no restriction on travel within France at this time, travellers are advised to take basic precautionary measures in order to limit their exposure to the situation; in particular plan ahead and follow the advice of government and police. Heed the advice and directives of Police officers and other security personnel at all times. Instructions delivered by the authorities may come across as extremely abrupt to members of the public; however this is necessary to get the message across in a fast, clear and concise manner. Have all personal identification, travel documents and emergency contact details at the ready. This is especially important if you are caught up in an incident and the police need to identify those in the vicinity quickly and efficiently. Keep abreast of the media and news information and ensure you are updated regularly on intended destinations and the security climate in them. This will also help you plan ahead to prevent delays. Ensure that alternative modes of travel and routes are factored into journey management plans. It is highly likely that public transport will be suspended following a major incident and other services may be impacted due to the knock-on effect. Ensure that communication protocols with company Health, Security & Safety, Environment (HSSE) departments are understood and practiced in advance. Make sure you remain in close contact with those responsible for your safety and security and seek advice where necessary. Report any suspicious activities, persons or objects to the nearest authorities as soon as possible. The public are the eyes and ears of the security services, particularly in the immediate aftermath of an incident. Remain extremely vigilant at all times. Be aware of your surroundings and trust your instincts. Be aware that further police operations are likely in the aftermath of a major incident. Follow the instructions of the police at all times. If ordered to leave an area, do so immediately but remain calm at all times. Following major terrorist related incidents such as this, when tensions remain high, misleading or false reporting of incidents can be a common occurrence, exacerbating the situation. Only trust credible sources and rely primarily on the information provided by police and the local authorities.